This post is to enter the competition on In The Powder Room. The question they want us to answer is: Who would you most like to meet in The Hoxton Powder Room, and why? I thought I would answer this with something that is relevant to how I am feeling at the moment. 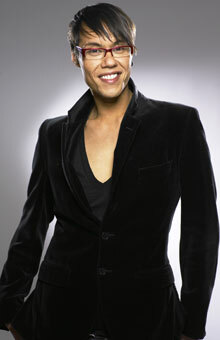 (Now, I know what I heard was right, this is Gok in Debenhams...). I am looking in the mirror, and I hear someone enter. I see his reflection in the mirror and recognise him instantly. He oozes self confidence and fashion chic! "Girlfriend you can't go to Cybermummy looking like that! You do realise this is the Mummy Blog outing of the year. The creme de la creme will be there". "Your jeans are the wrong cut, your jumper cuts off at the wrong point and makes you look dumpy, the neckline is all wrong and your jewellery is taking the eyes off your best asset - your cleavage - show off your bangers! Don't be shy". "And if you get a better bra, it will make your waist look smaller". "Come on "strip off I want to see you!" "What are you hiding under there?" "You're in your 30s. You should be a Yummy Mummy. Don't let these years pass you by!" "I've styled thousands of women over the years... how long have we got?" Me: "Well Cybermummy is on Saturday". "Okay well it's Thursday now and it's late night shopping in Oxford Street - let's go!" "I'd say your belly is the bit you want to change the most? 49% of women say that to me". Me: "Yeah, I call it my Mum Tum and I even set up something called MomenTum with my online blog friends". "Look, you simply need to start loving what you've got. You might think those bangers are heading south, but with the right bra those beauties will be your best asset!" "Anyway, I have proven in my shows that men prefer women with a little bit of meat on". Me: "Yeah but at Cybermummy I'll be with all women and you know what they can be like.... a lot more critical than men!" "I think with the right clothes you have curves in all the right places. Girls with meat on are sexier. Think J Lo rather than size zero". "You are not as big as you think you are. Look in the mirror, it's all yours and you need to feel proud of it. 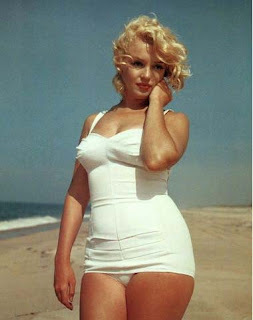 You should have been born in the 50s, think Marilyn Monroe, think curvaceous hips, movie starlets". "Slim is not necessarily beautiful - learn to love what you have!" "Right, now to the shops, Cybermummy, bring it on!"